Born on this day in 1914, Dylan Thomas (1914–1953) is perhaps more famous in death than he was in life. In life the Welsh poet is best remembered for his A Child's Christmas in Wales. In death he is the "roistering, drunken and doomed poet" who famously drank himself to death in New York City. 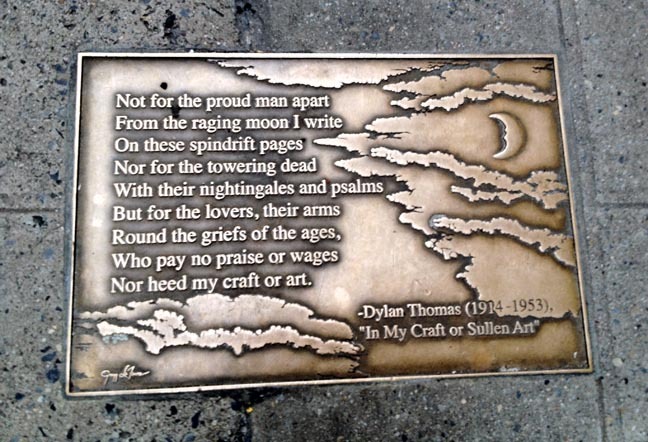 As memorialized in his adopted New York, it is the second verse of In My Craft or Sullen Art that is enshrined on Library Walk. The poem first appeared in Deaths and Entrances published in 1946. In My Craft or Sullen Art expertly captures the process and motivation of the poet — or of any creative mind who creates not for material gain but for something more substantial — something from within. Whether it be a birth day, anniversary or publication date of a seminal work, the Bar None Group will revisit these 40+ quotations from time to time — quotations that inspire one to write, read, explore and embrace literature. We last visited W.B. Yeats.